This one-pan meal is the perfect comfort food. Easy, delicious and it will be asked for time and time again. 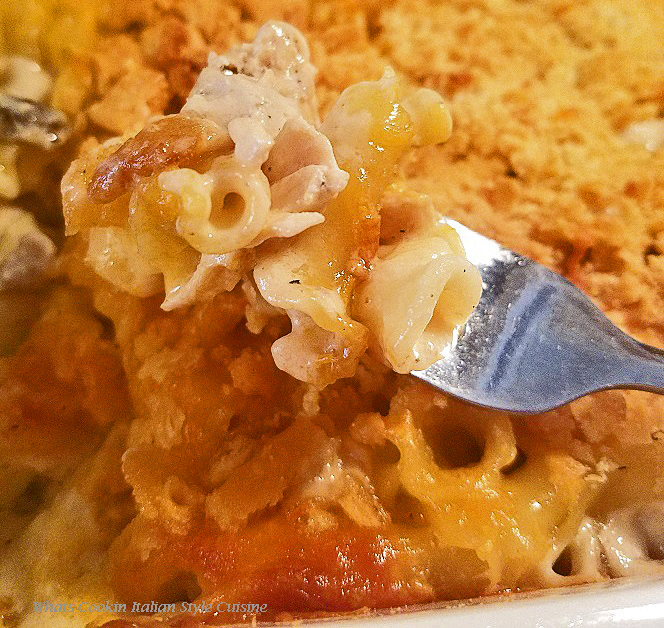 This Chicken Pasta Casserole is one of our families all time favorites. 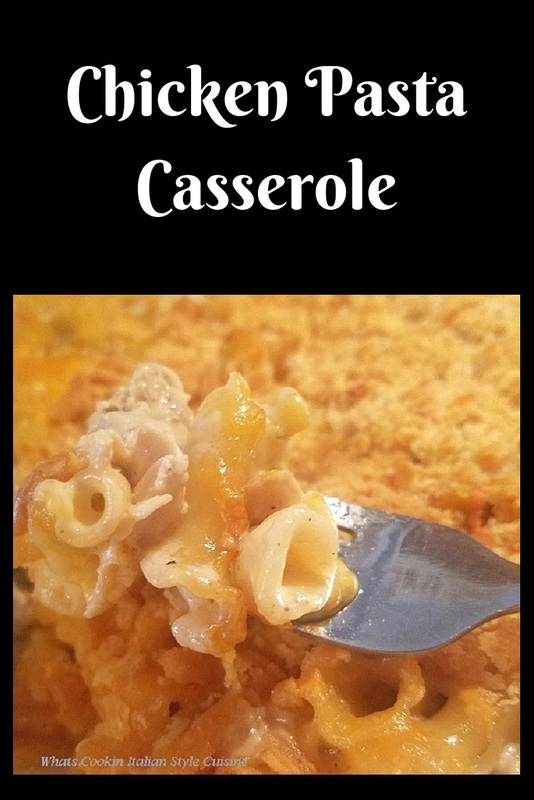 I love to add different things to this basic casserole dish. It's so versatile. You can mix in any vegetables you like, use other meats or just leave it just the way it is. 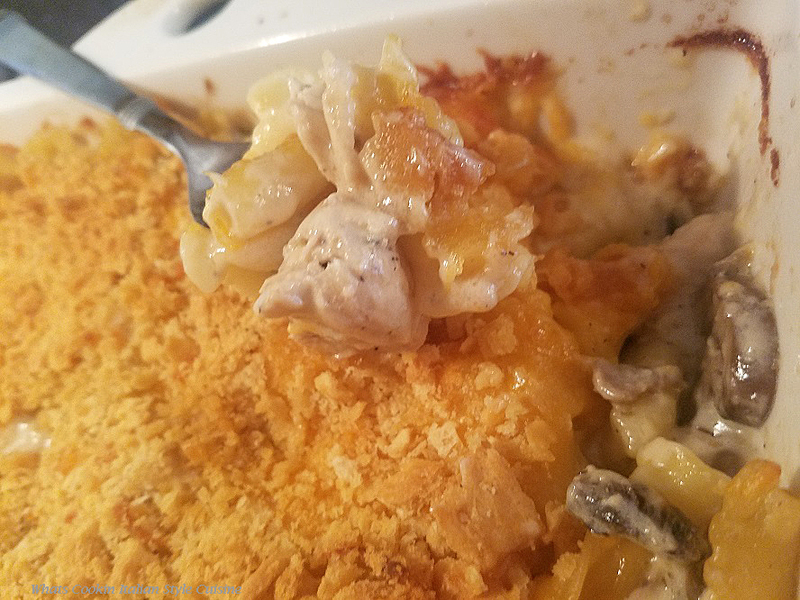 The cheese sauce with pasta and chicken is a classic old favorite mom made in the 1060s. A nice change and the kids love it and will ask for more. Scroll down and print this off. You won't want to miss trying this one. It's one of the best cooler weather foods that will warm you up instantly. I love all in one pan meal recipe. 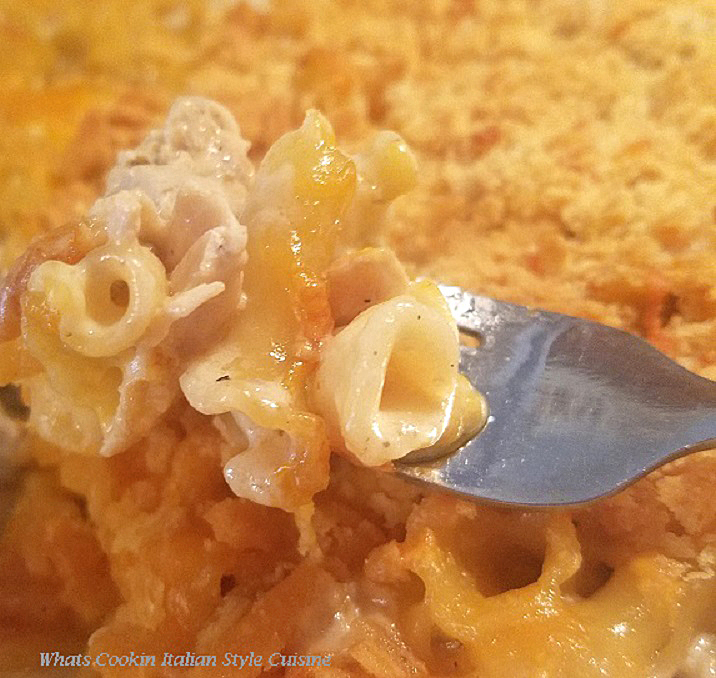 This casserole is so easy to put together and comfort food all the way. I love the sauce its makes and with the pasta, it's a huge hit with the whole family. 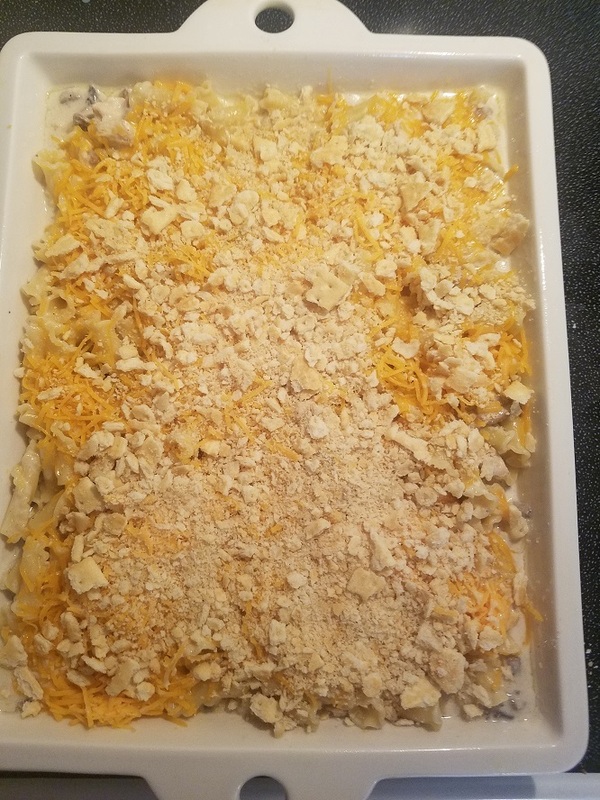 It really reminds me of a chicken mac and cheese style casserole dish! The sauce has a hint of garlic flavor and a delicious creamy texture that clings to the pasta with cheesy goodness. This is really an addicting cheese sauce you will love with or without adding meats to it. I have made this with just pasta in it or even with the addition of steam broccoli. The cheese compliments any vegetable you would put cheese on or any meat you want to substitute. During the cooler months, we always want something that will fill us up and pure comfort. 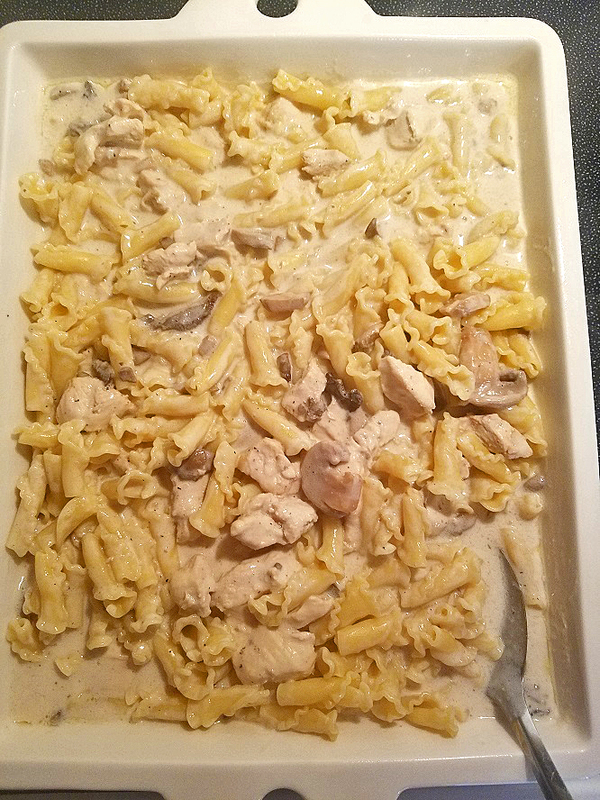 This casserole with the yummy cheese sauce, chicken and pasta will certainly fill the bill for that request! I love this homemade all from scratch recipe. But in a pinch, you can substitute it. I assure you, after you make it from scratch you will never use canned soup again! I have used all kinds of crackers, regular saltines, buttery flavored and even breadcrumbs for the top. I like to drizzle a little melted butter on the top of whatever crumbs I use to crisp them up. 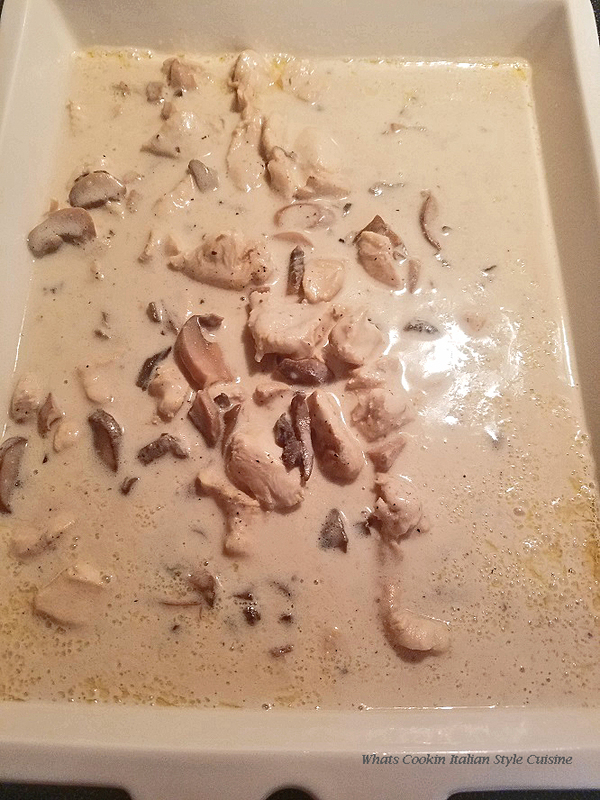 This casserole below in the photo was one I added mushrooms and chicken too, as I said you can add any additions your family loves!! No Soup Make A Roux! Like I said before, this is a no soup recipe. If you do choose to use soups, I would suggest a cheddar cheese soup or even a broccoli cheese soup. You can use the tried and true 1960s style using cream of mushroom or cream of chicken soups, I am not a fan of either. You can add whatever you like frozen assorted vegetables, mushrooms or even use a different meat. Cubed ham, leftover steak or pot roast, really anything goes great in this casserole dish. The creamy sauces blend well with the chicken. I have even added steamed broccoli with this dish. Substitute whatever your family loves, this recipe is a basic guideline. In this recipe, I used a pasta that we like called campanelle. You can find this pasta in most of the supermarkets. The pasta reminds me of a horn and has pretty edges to it. You can use any pasta you prefer. We have use shells, bowties, rotelle and egg noodles that all work fine, just to name a few. Check out this easy recipe, no it's not super fast but it sure is a lot better tasting all homemade. 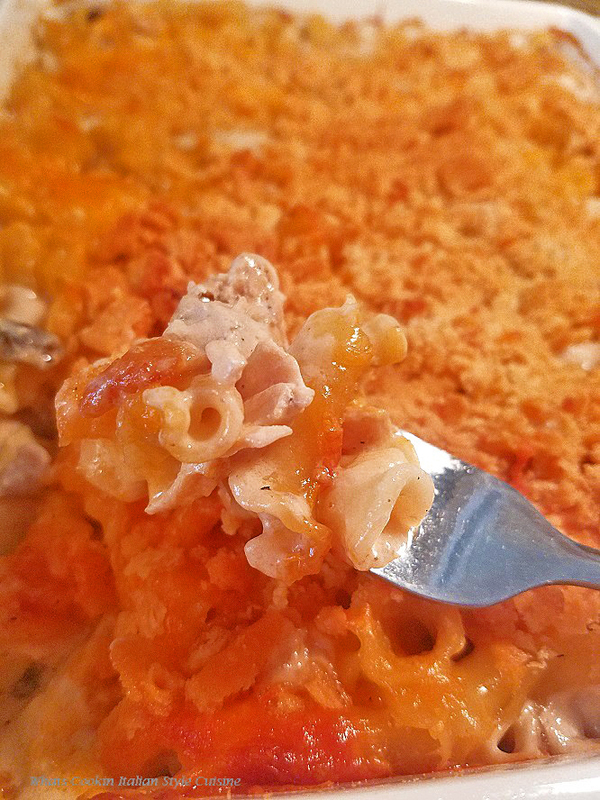 The flavors all blend together famously with this cheesy chicken and pasta casserole dish. When the kids ask for this dish you know it's a good family comforting meal! 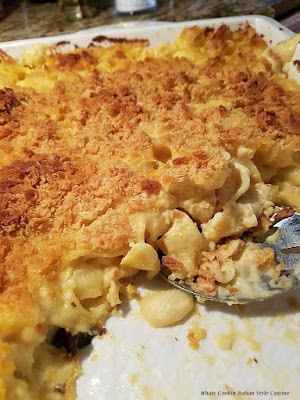 It's really similar in taste to a chicken and pasta mac and cheese and a great way to get them to eat meat. 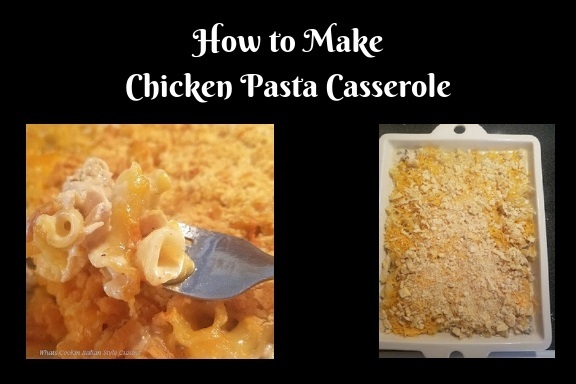 This is a delicious casserole made with sauteed chicken breast and pasta in a cheese sauce. It has a creamy homemade from scratch sauce that is perfect just on pasta plain or by adding meat or vegetables. The perfect basic recipe. Optional: add or substitute fresh or frozen vegetables, steamed broccoli, mushrooms, cubed ham, pork or beef. You can also use all sharp shredded cheddar or any other cheeses you prefer. Put oven rack in middle position and preheat oven to 400 degrees. Prepare baking dish. Butter and oil spray the bottom of a shallow 13 x 9 baking dish. Saute the chicken in 2 tablespoon butter or oil until pink is gone adding any additions suggested. Add the garlic halfway through cooking the chicken cubes. Add salt, pepper, granulated garlic to taste, Worcestershire sauce. Do not drain, the chicken will make a nice broth to use in this recipe. In a clean pan, melt the butter then add the flour to make a roux and stir until smooth. Stir in the milk with all the cheeses, Keep stirring occasionally. Season to taste Remove from heat. Cook pasta in another pan to package instructions to be al dente, drain. Place pasta in buttered or oil sprayed baking dish, pour the sauce over the top. Sprinkle with more shredded cheese and cracker crumbs. Bake until topping is crisp and sauce is bubbling 20 to 30 minutes. Don't Forget To Try My Favorite Leftover Prime Rib or Meat Pot Pie! 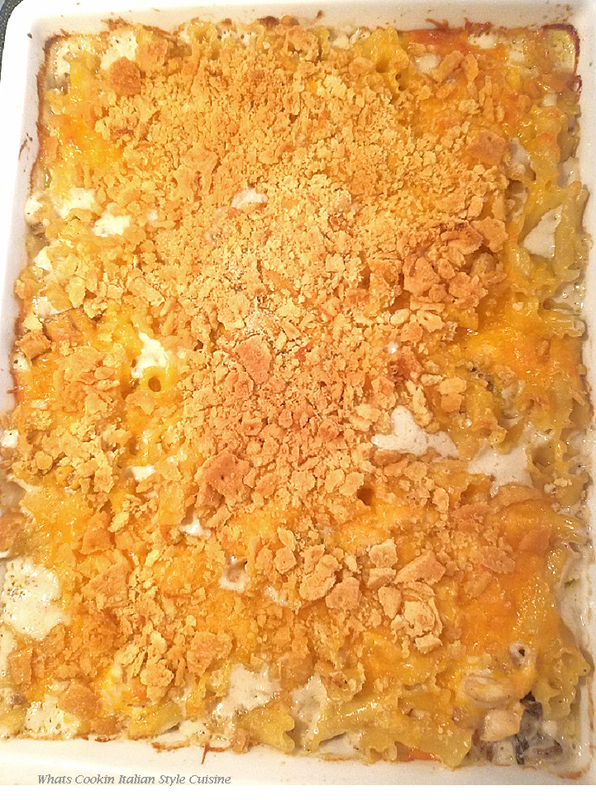 That creamy sauce and the golden crisp topping just have me DROOL terribly! A dish best loved by my family and friends and this one is just so perfect. this is seriously like the ultimate comfort food. i love the cheesy goodness of the chicken and pasta. i'd eat this stuff all day!! Yum, I love cheesy pasta, sounds great. You had me at cheesy! We love a chicken pasta bake - classic comfort food. This is exactly my sort of comfort food, love it! I can certainly see why this has been a family favorite for many years.